Nato il 10 Aprile 1999 a Nicosia, Cipro, comincia lo studio del pianoforte all’età di 12 anni, e studa alla Scuola di Coreografia Octavian Stroia a Cluj-Napoca, Romania. Inizia la sua formazione con la Maestra Cipriana Gavrisiu della Accademia di Musica “Gh. 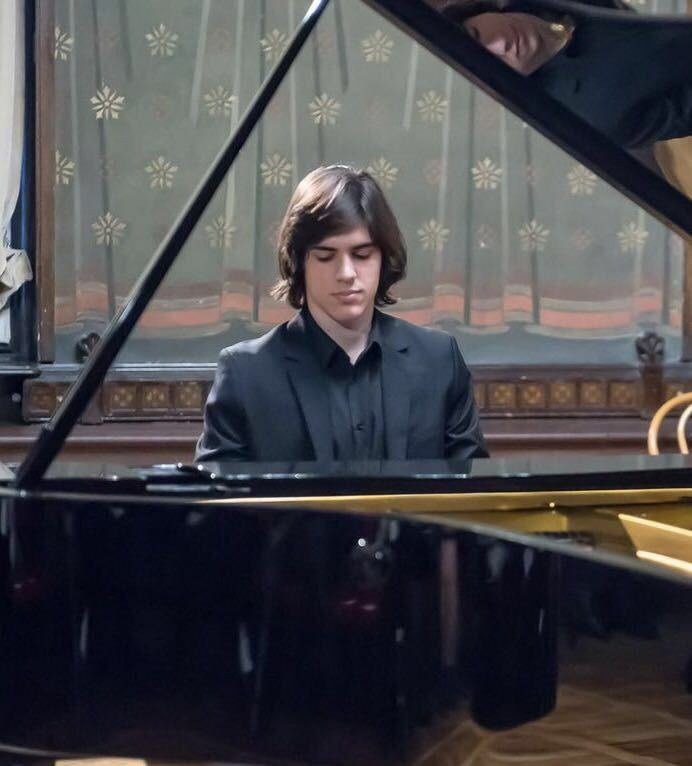 Dima” di Cluj-Napoca con continua a studiare.. Attualmente sta studiando il pianoforte presso il Collegio Nazionale di Musica Sigismund Toduta in Cluj-Napoca. Ha avuto l’opportunità di partecipare a masterclass in Italia, Malta e Romania con gli Maestri Vincenzo Balzani, Philippe Raskin, Benjamin Engeli, Viniciu Moroianu, Anton Kernjak, Yoshifumi Morita, Yuri Bogdanov, Albert Mamriev, Leonard Morales e Yuri Didenko. Ha vinto borse di studio alle Sonoro Interferente edizione 2015 e edizione 2016 alla Palazzo Ricci, Montepulciano, dove a studiato con la Maestra Diana Ketler. Dal 2016 è seguito dal Maestro Vincenzo Balzani a Milano. Born April 10th, 1999 in Nicosia, Cyprus, he began studying piano at the age of 12, during his studies at the School of Choreography Octavian Stroia in Cluj-Napoca, Romania. There he was noted by Anca Toncian, who guided him to study under professor Cipriana Gavrișiu of the Music Academy "Gheorghe Dima "of Cluj-Napoca that continues to be his teacher to this day. Currently he is studying piano at the “Gheorghe Dima” Academy of Music in Cluj-Napoca. Ștefan has won awards in national and international competitions including the Grand Prize at the Bach Festival in Cluj-Napoca 2014, 2nd prize at the “Piano Talents” International piano Competition Milan edition 2015, the Visio Rotary award in the Mozart Competition for Piano-Violin Cluj-Napoca duo 2015, the grand prize at the Irina Șațchi competition in Râmnicu-Vâlcea,1stabsolute prize at the international “Piano Talents” Competition in Milan 2017, the “Giovanni Turcotti” prize at Vlasesia International Music competition in Varallo 2018, and the 1stabsolute prize and the Tadini prize at the Tadini International Piano competition 2018. He had the opportunity to participate in Master Classes in Italy, Malta and Romania with professors Benjamin Engeli, Viniciu Moroianu, Anton Kernjak, Yoshifumi Morita, Yuri Bogdanov, Vincenzo Balzani, Albert Mamriev, Leonel Morales, Philippe Raskin, Diana Ketler, Emanuel Rimoldi and Yuri Didenko. He had the opportunity to give recitals in Rome, Milan, Lovere, Montepulciano, Como, Cantu, Seveso, Le Havre, Valetta, Sighisoara and Cluj-Napoca. Since 2016 he frequents Milan to study under the supervision of Maestro Balzani.